Here is the new Smart and Final Ad. Click on the image of the cover page to see all the products. 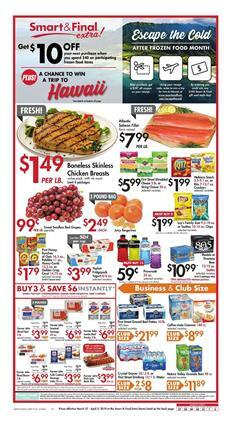 New deals on general grocery, snacks, breakfast food, beverage packs, household needs, and other weekly supplies. 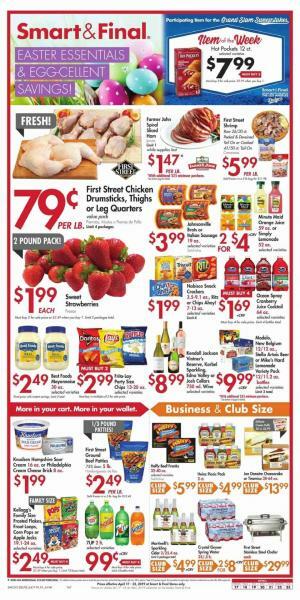 Coupons, mix or match deals, BOGOs, weekly price drops are great deals of the Smart and Final Weekly Ad content. You can often find a great discount on your favorite products of the categories above. Finding something in a Smart and Final Ad is not difficult at all. Simply, click on the arrows to browse through all the new items. Occasional deals like a chance to win a trip to a beautiful place can also be a thing in the ads. This retailer also has a trade for professionals. You can buy goods for your business. Smart and Final is a kind of warehouse of foods and weekly supplies. Some products have business and club size packs. If you want to become a savvy shopper, you might also want to track the special promotions that are announced on a weekly basis. Check out the coupons to match them up to the deals from other sources and boost your savings. Smart and Final has 300 stores in Oregon, Arizona, Nevada, Idaho, Washington, California, and Northern Mexico. It’s a subsidiary of Cash and Carry. First Street Ground Beef $3.99/lb. First Street Italian Sausage $3.99/lb. First Street Tilapia Fillets $10.99/lb.